Ginza Six is a brand new shopping complex that opens today in Tokyo's most prestigious shopping district, Ginza. Ginza Six is so named because it is on the Ginza 6-Chome intersection, on the site where the Matsuzakaya department store (Ginza's first) stood between 1924 and 2013. 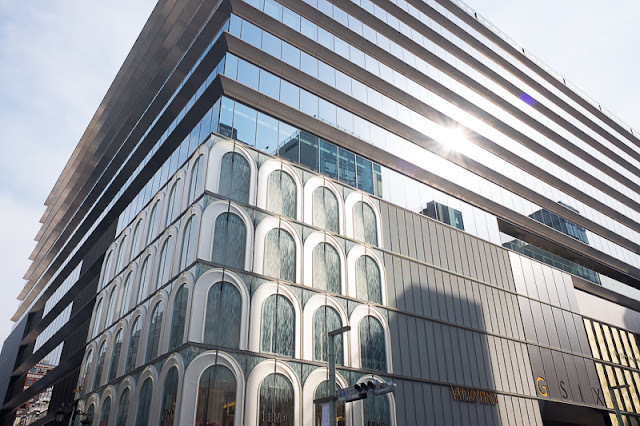 The company that runs the Matsuzakaya and Daimaru chains of department stores teamed up with Mori Building - most famous for its Roppongi Hills and Omotesando Hills complexes - as well as Sumitomo Real Estate - to bring this grand retail project to life. And grand is the word. Ginza Six is a sleek, imposing modern edifice designed by the prominent architect, Yoshio Taniguchi, with just enough of a minimal, functional air - and just enough use of wood inside - to save it from complete 80s glam. The building's facade is supposed to evoke the idea of sunrays and traditional Japanese noren curtains that typically hang in the doorways of restaurants. Ginza 6: a new home for international fashion brands in TokyoGinza Six's 17 floors (four of them below ground) house over 240 stores, half of which are fashion-related and with dozens and dozens of food-related establishments, too, and a dedicated delicatessen floor on B2. Special features at Ginza Six include a charming, church-like noh theater on the B3 floor, and a big, rather formal, rooftop garden that includes rows of maple and sakura trees.